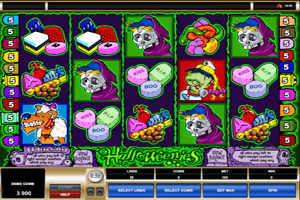 Halloweenies is a scary yet a very fun and an exciting video slot machine. The game has a Halloween theme, which is apparent from its name. The game takes the Halloween theme and adds fun to it, so players can enjoy a fun and a high paying experience while enjoying this Halloween theme. The game has 20 winning lines and five reels that players will place stakes on. These stakes can be placed straight at the bottom of the slot. Players will get to pick the number of coins the wish to place as well as the amount of lines they want to activate They can also pick the value of the coins used. After placing the bets, players can start spinning the reels by clicking on spin so they can watch the Halloween symbols that include many ghosts and scary monsters spin on the reels. Players will start earning payouts when they get a minimum of 3 matching symbols from left to right on any of the lines that they have activated. They can also earn payouts through the special symbols and icons that the game has in store. The Evil Pumpkin symbol is the bonus icon, 3 of this symbol will trigger the Pumpkin Bonus round for the lucky players. There is also a wild symbol, which is the group of colorful monsters and there is a scatter symbol that can activate up to 13 spins, which is the pink Easter bunny.